To keep pace with a rapidly growing population, Bengaluru is making huge investments in transportation infrastructure. One of the city’s newest metro stations, Krishna Rajendra Market Station, is a vibrant case study of how urban development can affect different communities. Located in the heart of Bengaluru’s informal economy, KR Market Station represents not only the metro system’s rapid expansion but the ways it might be managed differently to bring benefits to more residents. Rising land prices and changing economic and urban design policies risk pricing out current businesses and customers and short-circuiting a vibrant local economy. More inclusive development of Krishna Rajendra could help form policies that are a win-win for the community as well as the government. 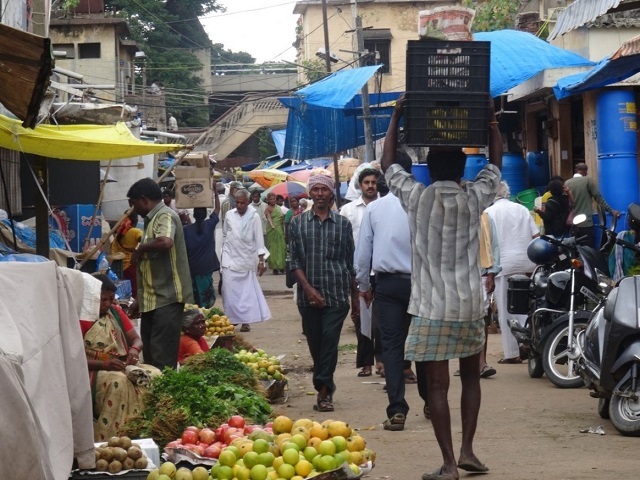 Traditional markets like Krishna Rajendra play an important role in reducing poverty in rapidly developing cities. They are hubs for job opportunities and offer lower prices for goods and services, making the city livable for a diverse population. 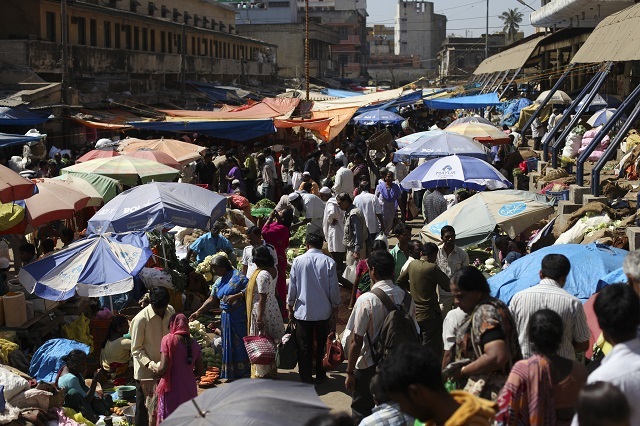 KR Market is estimated to provide jobs to more than 5,000 people and house businesses worth INR 40 lakhs ($60,100) a day. It’s an important component in connecting the urban core and its services, goods and employment opportunities to communities on the periphery. Bengaluru is financing its metro expansion through land value capture, however, a strategy that will likely lead to restructuring the market area through reconstruction and regeneration in order to maximize land values in the vicinity of stations. With current political and policy efforts in place, a certain degree of change can therefore be expected in KR Market. While on one hand the metro project may drive land diversification and densification, on the other, current benefits, such as affordable housing and employment opportunities, may be at risk. An increase in rent and cost of living would make it difficult for those that work and reside in the area to remain. A study analyzing the effects of an elevated highway through KR Market in 2000 showed that the project severely affected hawking and street vending by reducing the space for pedestrian movement by more than 50 percent and increasing the informal rent of hawking and vending spaces. There is cause for concern that development related to the new metro station will have a similar impact or worse on existing vendors. Some scholars argue that adaption to change is easier for smaller businesses. But my visit to KR Market in July 2015 forewarned that the aging hawkers and venders that populate the area, along with workers who lack permanent tenure, are among the most vulnerable groups. They will find it difficult to adapt to change. Many stakeholders on the ground did not have a clear understanding of the interventions planned for the area. Changes will therefore come as a shock to many, making adaptation difficult. What is the best way to dodge this bullet? Make the planning process more inclusive, democratic and equitable. Participatory processes and capacity-building programs can help communities prepare for urban change. While public meetings seeking community feedback and suggestions can be helpful in obtaining new ideas and solutions, transparency and awareness about plans that are already made is also important. Clarity about expected changes can help community members plan and adapt. Internet-based portals are common, but a pilot project from Nikšić, Montenegro, showed that employing a diversity of communications channels, including media, brochures, meetings, presentations and consultations, greatly improves citizen response. Encouraging the creation of community cooperatives and other organizing groups is another way to increase participation and transparency. Such informal groups can help communities become more resilient to shocks and stressors – natural and man-made – by providing social security, voice and representation. The COOP project funded by the UK Department for International Development has used this method to encourage informal entrepreneurship in the cities of Moshi and Arusha, Tanzania. Participation is not only important for preserving existing communities but also planning for relocation, if necessary. Experiences from Nairobi show that relocating hawkers and vendors to designated zones can be beneficial to them, provided the zones are created and registered based on the type of good sold. More importantly, the locations of the new zones were mutually agreed upon by the government, hawkers and vendors. These cases show that a participatory approach, whatever the specific solution, can lead to more diverse benefits from urban development projects. 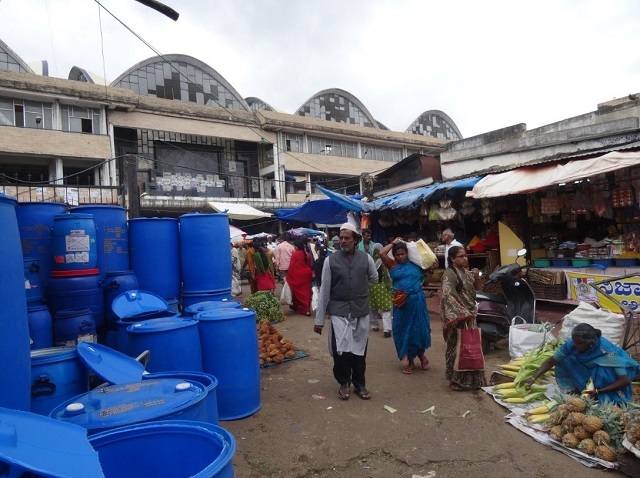 Bengaluru has an opportunity, with the venerable Krishna Rajendra Market, a pulsating node of local and informal economies, to find novel solutions toward more inclusive, sustainable development. Amartya Deb is a student at the University of Sheffield, specializing in cities and global development. Deb is also former consultant of World Resources Institute.